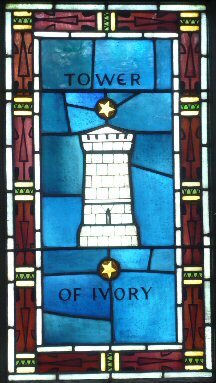 Tower of ivory . . . The title, "Tower of Ivory" when applied to Mary refers to her total spiritual purity, holiness, and nobility as the Mother of God. Because of divine favors God has given to her, Mary is set apart as the sinless and spotless Queen Mother of the Second Person of the Holy Trinity. She exercises authority over those whom her Son redeemed, and she is a powerful advocate to the Trinity; soliciting for her children's spiritual protection and welfare especially in times of need. 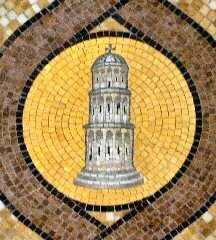 The Ivory Tower represents both the spotless purity of Mary's personhood , and her closeness with God the Holy Spirit in the Trinity.